Abstract — Advances in robotic technology have recently enabled the development of powered lower-limb prosthetic limbs. A major hurdle in developing commercially successful powered prostheses is the control interface. Myoelectric signals are one way for prosthetic users to provide feedforward volitional control of prosthesis mechanics. The goal of this study was to assess motor learning in people with lower-limb amputation using proportional myoelectric control from residual-limb muscles. We examined individuals with transtibial amputation and nondisabled controls performing tracking tasks of a virtual object. We assessed how quickly the individuals with amputation improved their performance and whether years since amputation correlated with performance. At the beginning of training, subjects with amputation performed much worse than control subjects. By the end of a short training period, tracking error did not significantly differ between subjects with amputation and nondisabled subjects. Initial but not final performance correlated significantly with time since amputation. This study demonstrates that although subjects with amputation may initially have poor volitional control of their residual lower-limb muscles, training can substantially improve their volitional control. These findings are encouraging for the future use of proportional myoelectric control of powered lower-limb prostheses. Key words: amputation, electromyography, motor learning, myoelectric, prosthetic, rehabilitation, residual limb, tracking task, transtibial, volitional control. Abbreviations: ANOVA = analysis of variance, EMG = electromyography, MVC = maximum voluntary contraction. There are more than 30 million people with amputation worldwide, and limb loss in the United States is expected to more than double by 2050 [1–2]. Advances in prosthetic technology have the potential to improve the quality of life of millions of people. Currently, the vast majority of lower-limb prostheses are passive devices. However, advances in actuators and other robotic technologies in recent years have made powered lower-limb prostheses possible [3–4]. The few powered devices that have become commercially available do not allow for direct user control, because they rely on kinetic and kinematic sensors to detect the user's intent. Incorporating input from the user's nervous system offers the advantage of feedforward intentional control with the potential for improved motor learning by the user. One way to implement nervous system input is through the use of myoelectric signals [5–6]. Using electrical signals from the muscles provides the potential to build controllers that yield a more natural and physiological control mode than traditional controllers that rely exclusively on kinematic and kinetic sensors. Many different upper-limb powered prostheses use myoelectric control, but widespread acceptance is limited. This is due to the high cost of the prostheses and the difficulty in providing precise position control needed in arms and hands with many degrees of freedom . Although myoelectric control has been proposed for use in the lower limbs [8–14], there has been little development because of the difficulty of recording reliable signals from the residual limb within the socket. Using surface electrodes, a few prototype powered lower-limb prostheses have used myoelectric signals from residual-limb surface electrodes within the socket-limb interface [4,13]. 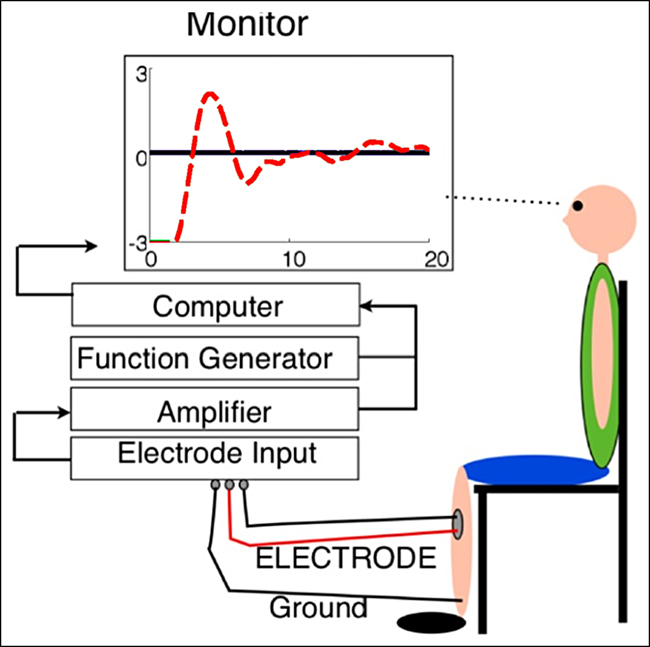 Using electrodes within the socket-limb interface, movement artifact in the electromyography (EMG) signal is difficult to avoid and often dominates the signal during gait and other whole-body movements using lower-limb prostheses. The development of intramuscular myoelectric sensors [15–16] and use of myoelectric roll-on sleeves [17–18] would open up new possibilities for myoelectric control of powered prostheses in the future. Even with advancements in myoelectric sensors and interfaces, powered prostheses require control interfaces with more natural control modes. To control the prosthetic state (i.e., current configuration), researchers have used various approaches, such as machine learning, decoders, pattern recognition, and proportional control [5,13,19–28]. Except for proportional control, these methods classify the subject's myoelectric signals and actuate the prosthetic device based on predetermined states, such as hand-open or hand-closed positions. State-classifying control methods have two inherent drawbacks: (1) they only allow the subject to perform predetermined movements and (2) they limit the user's ability to control the magnitude of torque production. Alternatively, proportional myoelectric controllers use the subject's muscle activation to control the magnitude of joint torque for the powered device, which may be more beneficial in lower-limb control [29–31]. There have been a number of research studies on nondisabled subjects and individuals with upper-limb amputation using proportional myoelectric control [29–32], but important differences exist in regards to applying proportional myoelectric control to individuals with lower-limb amputation. For example, neural control of the upper limb is generally more plastic than neural control of the lower limb [33–35]. Currently, there is a lack of evidence to demonstrate volitional proportional control in lower-limb prosthesis using residual lower-limb muscle activity. Gordon and Ferris demonstrated very rapid motor learning using upper-limb proportional myoelectric control in nondisabled subjects . Because the lower limb is not typically used for fine motor control tasks, it is not known whether similar control resolution could be achieved with proportional myoelectric control from lower-limb muscles. The purpose of this study was to assess motor learning in individuals with lower-limb amputation using proportional myoelectric control from residual-limb muscles. We examined subjects with transtibial amputation and nondisabled subjects as they attempted to control one-dimensional movement of a virtual object on a computer screen with EMG from the tibialis anterior muscle. We used one-dimensional movement because a simple robotic ankle prosthetic could employ a one-degree of freedom proportional controller for dorsiflexion/plantar flexion. We hypothesized that the subjects with amputation would initially have poor volitional myoelectric control of the virtual object compared with the nondisabled control subjects. We also hypothesized that a relatively short amount of practice would result in significant improvements in volitional myoelectric control for both groups. 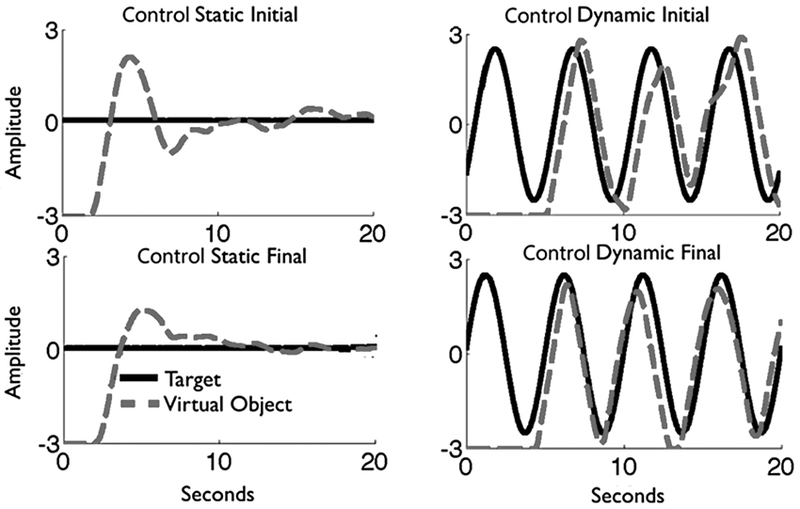 We examined myoelectric controllability by asking subjects to control a virtual object on a computer screen in an attempt to match a virtual target. 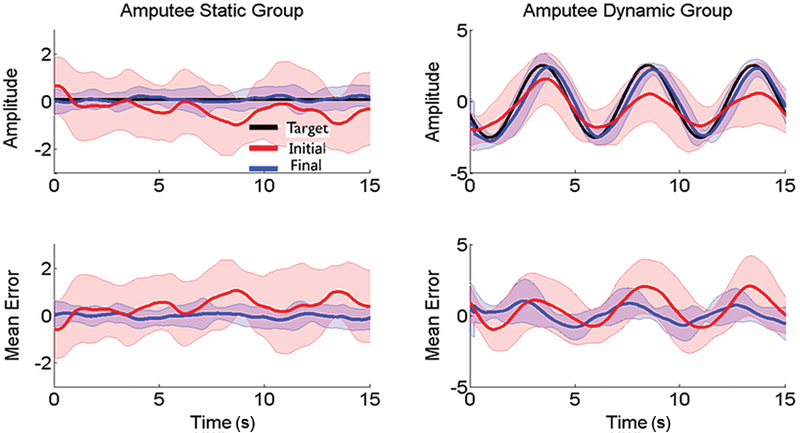 EMG from the tibialis anterior muscle in amputee and nondisabled (control) subjects altered the path of the virtual object trajectory by controlling the object's acceleration. We assessed virtual object tracking error during static and dynamic virtual target trials before and after practice sessions. We recorded each participant's age, time since amputation, and type of amputation (Table). Subjects consisted of 9 unilateral transtibial amputees (mean ± standard deviation age 50 ± 14 yr; 7 male and 2 female) and 13 nondisabled individuals (age 25 ± 13 yr; 10 male and 3 female). Only 1 of our amputee subjects had an amputation because of vascular causes; the rest were the result of trauma. Seven of the subjects with amputation had their amputation about 5 yr ago and two had their amputation more than 15 yr ago. We had no medical or posttrauma anatomical structure information about the subjects with amputation. In order to participate, subjects had to (1) have the ability to volitionally contract the tibialis anterior muscle, (2) have no serious medical conditions or pain, and (3) be between the ages of 15 and 80. We recruited subjects with amputation from the University of Michigan Amputee Support Group and the University of Michigan Orthotics and Prosthetics Center. We recruited nondisabled subjects by using flyers at the University of Michigan Ann Arbor campus. Characteristics of 9 subjects with unilateral transtibial amputation. We instructed subjects to control a virtual object to match the position of a target object on a screen. This methodology mirrors one from a previous study on nondisabled subjects . Subjects sat upright in front of a monitor that displayed a virtual object and a target object (Figure 1). Electromyography (EMG) was collected from surface electrodes placed over tibialis anterior muscle while subjects sat in chair. EMG signal was amplified and processed, then sent to computer in parallel with input from function generator. EMG signal controlled movement of virtual object position, and function generator controlled target. Computer displayed in real time the virtual object and target's position to screen in front of subjects. The monitor projected the virtual object's movement, calculated from a real-time computer interface (dSPACE Inc; Wixom, Michigan). The computer interface calculated the position of the virtual object based on a surface EMG signal recorded over the dorsal surface of the subject's shank (Figure 2). Example of electrode placement on subject with amputation. We placed electrodes based on manual palpation of skin surface while subjects attempted to maximally activate their dorsiflexor muscles. We placed electrodes on the subjects with amputation based on manual palpation of the skin surface while subjects attempted to maximally activate their dorsiflexor muscles. The signal-conditioning amplifier (Konigsberg Instruments Inc; Pasadena, California) had a frequency range of 10–1,000 Hz and was connected to a computer that sampled the data at 1,000 Hz. We digitally filtered the signal using a second order Butterworth high-pass filter (cutoff frequency = 20 Hz) to remove movement artifacts and a second order Butterworth low-pass filter (cutoff frequency = 10 Hz) to smooth the control signal. We asked subjects to relax for three 5 s trials and used that average relaxed value to determine the baseline noise level. We used this baseline level to zero the signal, removing the resting background noise. We normalized signal amplitudes during all trials to each subject's maximum voluntary contraction (MVC). Normalization compensated for potential differences in muscle recruitment between subjects and prevented fatigue. This allowed all subjects to perform the task regardless of muscle strength. We used the greatest average EMG signal amplitude over 1 s of three 5 s maximal contraction trials to determine the subject's MVC. where s was the filtered, zeroed, and normalized input from the EMG signal; c was the damping coefficient; Y was the vertical position; G was a virtual gravity; and m was a virtual mass. We set m and c to 0.5 (both unitless) to prevent fatigue. This allowed subjects to perform the tracking tasks while keeping their myoelectric amplitudes lower than 25 percent of their MVC . The low c made the task difficult because it was harder to bring the virtual object to rest than with a high c. Subjects could move the virtual object to the target, but achieving zero velocity at any given point was extremely difficult even for nondisabled subjects . The artificial gravity (G) was set to 0.2 (unitless) so that the virtual object dropped twice as fast as the target when the subject was at rest; this challenged the subject to control the rate of falling during the dynamic trials. We instructed subjects to match the position of the target object for 20 s during each trial. We informed subjects that we would not calculate the first 5 s of each trial and that they could use this time to line themselves up with the target. Subjects performed 20 trials over 1 h, taking breaks between trials. Subjects were able to rest for as long as they wanted but were required to break for at least 1 min between trials. During the 20 trials, subjects alternated between a static and a dynamic task. During the static task, the target object's vertical position was set to zero as it moved across the screen drawing a straight line (Figures 3 and 4). The static task assessed the subjects– ability to maintain a constant activation level. During the dynamic task, the target moved across the screen in a sinusoidal wave (frequency = 0.2 Hz) with dimensionless amplitude of 2.5 (Figures 3 and 4). The dynamic task assessed the subjects– ability to actively adjust muscle activation level and maintain phase throughout the trial. Although the muscular activation during these tasks does not compare directly to ambulation, each task did challenge our participants and provided a method to test motor control and motor learning. 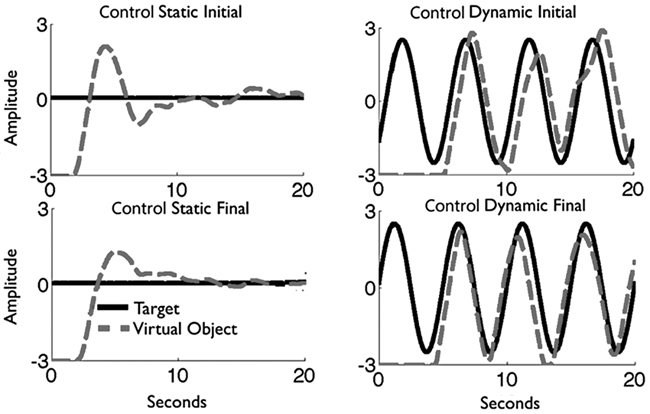 Sample representation of control subject's static and dynamic trials. Solid line represents target position and dashed line represents virtual object position. Amplitude on y-axis is unitless.Subject's tracking error was not calculated for initial 5 s of trial. Sample representation of static and dynamic trials from subject with amputation. Solid line represents target position and dashed line represents virtual object position. Amplitude on y-axis is unitless. Subject's tracking error was not calculated for initial 5 s of trial. We analyzed the initial and final trials of both the static and dynamic tasks. We used only the last 15 s of each trial for analysis, ignoring the first 5 s of each trial to remove errors related to the virtual object starting away from the target. For each trial, we calculated the root-mean-square error between the target and the actual position of the virtual object. We used a repeated measures analysis of variance (ANOVA) (p – 0.05) to test for significant differences in root-mean-square error, considering the effects of trial (initial and final), group (amputee and nondisabled), and task (static and dynamic). For the group averages of the dynamics trials (Figures 5 and 6), we lined up the first minima of the target that occurred within the first 5 s for all subjects. Control group's average virtual object positions and errors. In first series of graphs, we have group average for dynamic and static tasks. Black line represents target position for each task. Red line represents virtual object position during initial trial and blue linevirtual object position during final trial for each task. Shaded regions are 1 standard deviation for each respective line. Subjects demonstrate improvement from initial to final trials. This improvement is most apparent when looking at second set of graphs, which show group mean error between static and dynamic tasks. Red line represents virtual object mean error during initial trial and blue line virtual object mean error during final trial for each task. Amputee group's average virtual object positions and errors. In first series of graphs, we have group average for dynamic and static tasks. Black line represents target position for each task. Red line represents virtual object position during initial trial and blue linevirtual object position during final trial for each task. Shaded regions are 1 standard deviation from each respective line. Similar to control subjects, amputee subjects improved from initial to final trials. This improvement is most apparent in second set of graphs, which show group mean error between static and dynamic tasks. Red line represents virtual object mean error during initial trial and blue line virtual object mean error during final trial for each task. 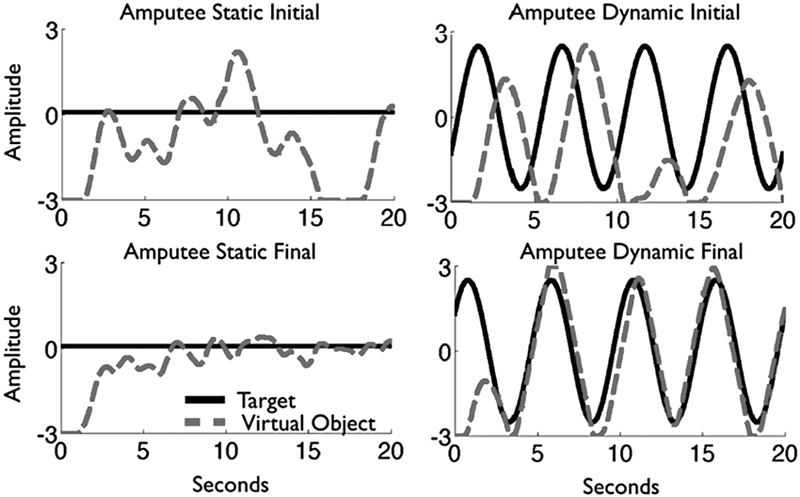 During the initial static and dynamic trials, the group with amputation had significantly larger mean virtual object trajectory error than the control group (Figures 3–6). Control subjects had root-mean-square errors that were 33 percent lower for the static trials and 40 percent lower for the dynamic trials than those of the subjects with amputation (Figure 7; p < 0.01). The repeated measures ANOVA indicated significant effects for group (nondisabled control vs amputee) and trial (initial vs final) and the interaction between group and trial. 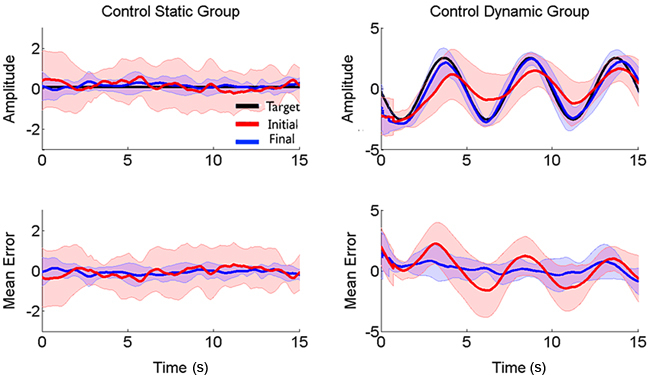 There was a pairwise difference between the static and dynamic tasks; all subjects had higher tracking errors during the static task than the dynamic task (p < 0.05). By the final trials, the nondisabled group had improved by an average of 50 percent and the group with amputation had improved by an average of 66 percent (Figure 7). For the final trials, there was no longer any significant difference between groups in root-mean-square error (Figure 7; p = 0.59). Mean tracking error of control (solid bars) and amputee subjects (striped bars) for each task and trial. 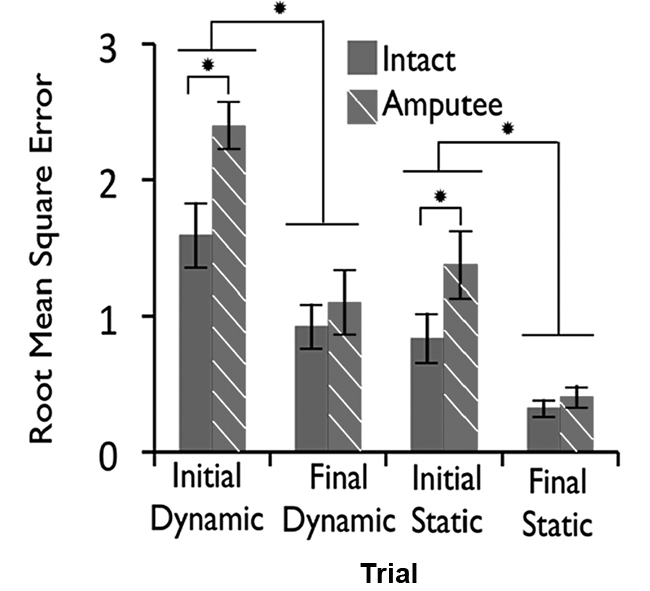 During initial static and dynamic trials, control and amputee subjects had statistically significant differences in virtual object tracking error as measured by root-mean-square error (*repeated measures analysis of variance and t-test pairwise comparison, p < 0.05). By final static and dynamic trials, no significant differences existed between the two groups (p > 0.05). The purpose of this study was to assess motor learning by subjects with transtibial amputation performing proportional myoelectric control with residual lower-limb muscles. As hypothesized, we found that the subjects with amputation initially had relatively poor volitional myoelectric control of the movement of a virtual object compared with control subjects. However, with short-term practice, the subjects with amputation were able to improve their myoelectric control during both static and dynamic tests to match that of control subjects. The relatively poor myoelectric control initially demonstrated by subjects with amputation may be have been due to a number of factors. Amputation generally leads to muscle atrophy, nerve degeneration, and scar tissue buildup [36–38]. In addition, amputation results in considerable plasticity and reorganization throughout the central and peripheral nervous systems because of the disuse of the muscles [36,38–39]. This reorganization can have significant effects on volitional motor control [36,40]. People with amputation have been shown to have a significantly higher motor threshold during transcranial magnetic stimulation of the amputated-limb motor cortex compared with the control-limb motor cortex . These factors suggest that it may be more difficult for subjects with amputation to volitionally control their residual lower-limb muscles. In spite of significant differences between groups during the initial trials, subjects with amputation were able to quickly and significantly improve their control performance with practice in both the static and dynamic tasks. Muscles in the lower limb do not normally need to perform fine motor control tasks, because their main roles are in force and power generation . As a result, the level of motor adaption possible in lower-limb muscle recruitment has been thought to be rather limited. This perspective was based in part on studies in which physiologists surgically altered the attachment sites of muscles in animals [33–35,43–44]. Examination of hind limb EMG patterns revealed that the original muscle activation patterns persisted even after an extended time period, but there was greater adaptation in the forelimbs of animals, especially when making discrete reaching motions [33–35,43–44]. Other results indicating limited lower-limb neural plasticity have come from clinical studies on patients. Similar tendon-muscle transplantations are regularly performed on children with cerebral palsy, with the intention of correcting gait pathologies. A comparison of the pre- and postoperative muscle activation patterns in these children indicates that the locomotion muscle activation patterns are unchanged for the transplanted muscles [45–46]. These findings support the concept of limited adaptability for locomotor muscle activity patterns. While our study demonstrated motor adaptation in lower-limb muscle recruitment, we did not test neuromuscular adaptation during standing or walking. When humans stand or walk, numerous proprioceptive pathways can affect muscle recruitment [47–48]. Furthermore, there is a much greater reliance on spinal neural networks in recruiting muscles during human locomotion, and this likely influences the amount of plasticity possible . While additional recruitment pathways may be involved during standing and walking than sitting, we believe the results from seated training/testing are relevant to locomotion. The changes in the seated position are likely due to adaptation in descending commands, and these commands could presumably affect the patterns during standing or walking. Future studies could expand our approach to examine subjects with amputation during weight-bearing activities such as standing and walking. This would provide details on how residual-limb muscles perform as a control source for a prosthesis in real-world settings. This would also determine whether the added inertia of the prosthesis affects the motor adaptation during learning, given that we tested subjects not wearing prostheses. Our results support the idea that people with amputation may be able to quickly adapt residual lower-limb muscle EMG amplitudes during gait similar to what nondisabled subjects have shown when walking with robotic lower-limb exoskeletons under proportional myoelectric control [42,50–52]. In those exoskeleton studies, we found that long-term training demonstrated clear retention, such that multiple days of training decreased adaptation times as training increased. The washout period from those studies was relatively short (under 5 min) and also decreased with longer duration training. We would expect a similar effect with long-term training of amputees using proportional myoelectric control of a powered lower-limb prosthesis. In addition to the possibility of improved function in lower-limb prostheses, increased lower-limb residual muscle activity may lead to secondary benefits. The active recruitment of the residual-limb muscles for control of the prosthesis could help prevent atrophy and lead to better socket fit. Evidence also exists that myoelectric control practice can promote beneficial neural reorganization and reduce the occurrence of phantom-limb pain in subjects with amputation . Thus, extended use of residual-limb muscle myoelectric control might have a long-term positive effect on neuronal reorganization [38–39]. Future studies could use brain-mapping tools, such as transcranial magnetic stimulation, functional magnetic resonance imaging, or high-density electroencephalography, to explore this topic. These techniques could provide insight about the effects of residual-limb use on the motor hierarchy and help develop future therapies to reduce negative effects that occur after amputation. The subjects with amputation had greater improvements in control than the control subjects. We believe this was likely due to their initial performance levels. Subjects with amputation had a very large volitional trajectory error during the first test. 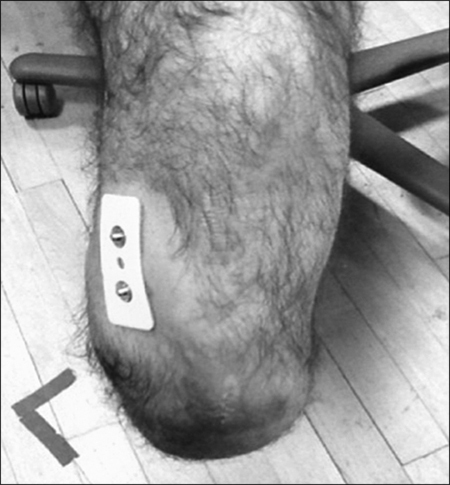 While control subjects regularly use tibialis anterior muscle control during gait and other activities, the people with transtibial amputation had not had functional use of this residual-limb muscle since before their amputation. The large improvement in volitional trajectory error with training by the subjects with amputation resulted in no significant difference between control and amputee subjects on final testing. Practice is likely a stronger factor in ability to perform proportional myoelectric control than having an amputation (Figure 7). Even subjects who had amputations up to 15 yr earlier still significantly improved their volitional control in our study. Clinically, this indicates that individuals who have lived with their amputations for many years can still quickly learn to actively control the myoelectric signals from their residual-limb muscle. Because initial poor performance in the tracking task was largely due to limb disuse, we would expect performance with the intact leg of subjects with amputation to match the performance of the control legs of nondisabled subjects. We were not able to compare the results of the amputee subjects– intact limb with that of their amputated limb. If subjects with amputation had trained first with one limb and then the other, there would have been confounding learning effects related to practice with the contralateral limb [53–54]. It is difficult to determine whether other amputee populations, such as people with transfemoral, knee disarticulation, and Syme's amputations, would perform differently. Results from Gordon and Ferris suggest that practice plays a larger role in control than the location of the muscle . For this reason, we might expect individuals with different levels of amputation to demonstrate similar results. We expect that people with Syme's amputation would perform similarly or even better because they retain more of their legs– musculoskeletal structure after amputation and use their amputated limb for more activities than people with transtibial amputation [37,55–57]. In addition to type of amputations, different surgical techniques could have also affected our results. While we did not have information on the specific surgical techniques used on our subjects, we were able to locate muscle bodies near the tibia and the results were consistent across subjects. Surgical techniques could possibly have affected tracking task performance. For example, subjects who underwent amputation without myodesis might have had lower initial performance than those with myodesis, because of differences in the structure of the residual-limb muscles . The magnitude and quality of muscle activation used for the controller depends on the muscle mass and structure. As a result, we would expect patients with the best preservation of muscle mass to perform best with proportional myoelectric control. There are several limitations to this study. 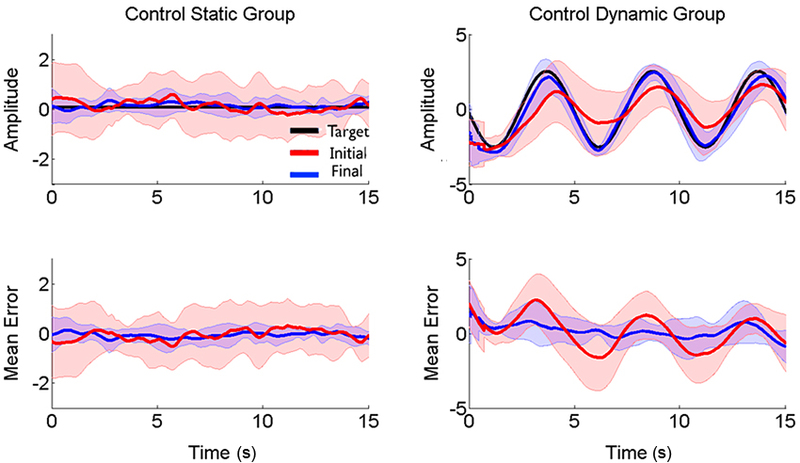 Control subjects were significantly younger than subjects with amputation, which may be a confounding factor in tracking error of controlling a myoelectric signal. However, we do not believe this to be a major limitation. Our study normalized for each subject's maximum muscle recruitment levels to compensate for potential recruitment differences. In addition, we believe the age differences between groups are not substantial enough to account for the significantly larger root-mean-square error between the groups. Lastly, it is important to realize that after a short training period, no statistical differences existed between the two groups. If substantial effects of age existed, then differences should have continued even after training. A final limitation is that we did not monitor gastrocnemius EMG, so we do not know how recruitment of gastrocnemius changed during training. A previous study has shown that people with transtibial amputation are prone to producing coactivation of tibialis anterior and gastrocnemius during contraction , so our results may be due to volitional co-contraction. While our results indicate that the subjects improved the resolution of tibialis anterior recruitment, we do not know whether they improved the ability to recruit tibialis anterior relative to gastrocnemius. Although subjects with transtibial amputation had more initial difficulty with proportional myoelectric control using their residual-limb muscles than the nondisabled control subjects, a short training period enabled them to match the performance level of control subjects. 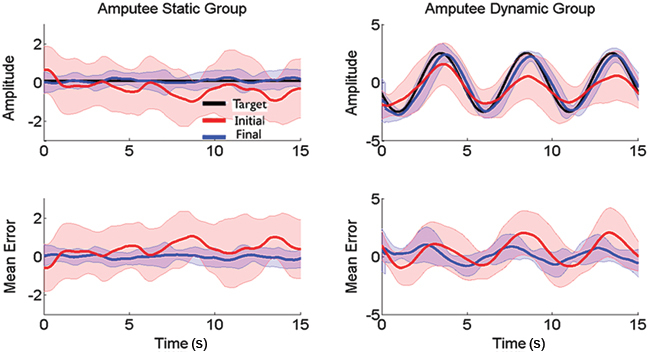 Time since amputation did appear to reduce myoelectric control performance initially, but training greatly reduced the effects of time since amputation. These findings are encouraging for the use of residual-limb proportional myoelectric control to improve powered lower-limb prosthetic devices. Further studies using proportional myoelectric control during gait are warranted to assess the degree of motor learning and performance by people with amputation. Concept and design: D. P. Ferris, D. C. Morgenroth, R. E. Alcaide-Aguirre. Development Award (D. C. Morgenroth). Additional Contributions: The authors thank all the study participants and the laboratory members of the Human Neuromechanics Laboratory for their help. We are especially grateful to Stephanie Huang for help with recruitment. Institutional Review: All subjects provided informed written consent. The University of Michigan Human Subjects Protection Office approved the protocol, and all procedures were in accordance with the Declaration of Helsinki. Uellendahl JE. Upper extremity myoelectric prosthetics. Phys Med Rehabil Clin N Am. 2000;11(3):639–52. Au S, Bonato P, Herr H. An EMG-position controlled system for an active ankle-foot prosthesis: an initial experimental study. Proceedings of the IEEE 9th Biannual ICORR; 2005 Jun 28–Jul 1; Chicago, IL. New York (NY): IEEE; 2005. p. 375–79. Merrill DR, Lockhart J, Troyk PR, Weir RF, Hankin DL. Development of an implantable myoelectric sensor for advanced prosthesis control. Artif Organs. 2011;35(3):249–52. Daly W. Clinical application of roll-on sleeves for myoelectrically controlled transradial and transhumeral prostheses. J Prosthet Orthot. 2000;12(3):88–91. Salam Y. The use of silicone suspension sleeves with myoelectric fittings. J Prosthet Orthot. 1994;6(4):119–20. Cipriani C, Antfolk C, Controzzi M, Lundborg G, Rosen B, Carrozza MC, Sebelius F. Online myoelectric control of a dexterous hand prosthesis by transradial amputees. IEEE Trans Neural Syst Rehabil Eng. 2011;19(3):260–70. Englehart K, Hudgins B, Parker PA. A wavelet-based continuous classification scheme for multifunction myoelectric control. IEEE Trans Biomed Eng. 2001;48(3):302–11. Hargrove LJ, Li G, Englehart KB, Hudgins BS. Principal components analysis preprocessing for improved classification accuracies in pattern-recognition-based myoelectric control. IEEE Trans Biomed Eng. 2009;56(5):1407–14. Karlik B, Tokhi MO, Alci M. A fuzzy clustering neural network architecture for multifunction upper-limb prosthesis. IEEE Trans Biomed Eng. 2003;50(11):1255–61. Li G, Kuiken TA. EMG pattern recognition control of multifunctional prostheses by transradial amputees. Conf Proc IEEE Eng Med Biol Soc. 2009;2009:6914–17. Lenzi T, De Rossi SM, Vitiello N, Carrozza MC. Proportional EMG control for upper-limb powered exoskeletons. Conf Proc IEEE Eng Med Biol Soc. 2011;2011:628–31. Sperry RW. The functional results of muscle transposition in the hind limb of the rat. J Comp Neurol. 1940;73(3): 379–404. Bowker JH. The lower limb. Smith DG, Micheal JW, Bowker JH, editors. Atlas of amputations and limb deficiencies. 3rd ed. Rosemont (IL): American Academy of Orthopaedic Surgeons; 2004. p. 481–503. Kao P-C, Lewis CL, Ferris DP. Invariant ankle moment patterns when walking with and without a robotic ankle exoskeleton. J Biomech. 2010;43(2):203–9. Waters RL, Frazier J, Garland DE, Jordan C, Perry J. Electromyographic gait analysis before and after operative treatment for hemiplegic equinus and equinovarus deformity. J Bone Joint Surg Am. 1982;64(2):284–88. Pearson KG. Generating the walking gait: role of sensory feedback. Prog Brain Res. 2004;143:123–29. Pearson KG. Neural adaptation in the generation of rhythmic behavior. Annu Rev Physiol. 2000;62:723–53. Gordon KE, Ferris DP. Learning to walk with a robotic ankle exoskeleton. J Biomech. 2007;40(12):2636–44. St°kel T, Wang J. Transfer of short-term motor learning across the lower limbs as a function of task conception and practice order. Brain Cogn. 2011;77(2):271–79. Gaine WJ, McCreath SW. Syme's amputation revisited: a review of 46 cases. J Bone Joint Surg Br. 1996;78(3):461–67. Waters RL, Perry J, Antonelli D, Hislop H. Energy cost of walking of amputees: the influence of level of amputation. J Bone Joint Surg Am. 1976;58(1):42–46. Submitted for publication June 21, 2012. Accepted in revised form October 29, 2012. Alcaide-Aguirre RE, Morgenroth DC, Ferris DP. 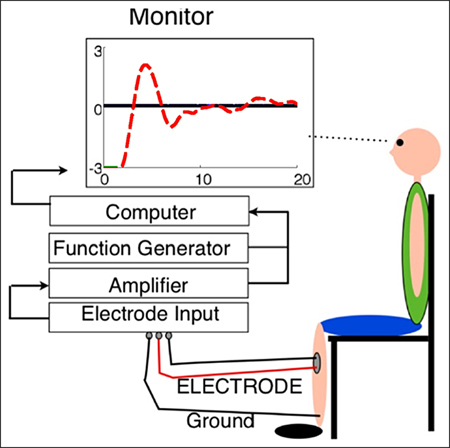 Motor control and learning with lower-limb myoelectric control in amputees. J Rehabil Res Dev. 2013;50(5):687–98.